At 1100 meters above sea level, in the heart of hundreds of years old lava flows and pristine areas in an untamed landscape, from wonderful vines of Grecanico Dorato, in our Casa Decima vineyard, it’s here that our Millesulmare is born, a wine with an extraordinary mineral content and a refined scent of mountain and sea. On the impervious North-western slope of Mount Etna, in one of the vineyard at the highest altitude in Europe, the passing of centuries has created the perfect context where this charming local vine variety can be grown, as the ancient winemakers did for entire generations, with passion and true efforts. Even if it’s characterized by a huge lava structure, this heroic place is rich of small orchards and verdant woods. This is the landscape surrounding our vineyard, Casa Decima at Contrada Nave, which never ceases to let us perceive its timeless beauty and where man keeps coming to terms with nature, in a mutual exchange of love and trust. 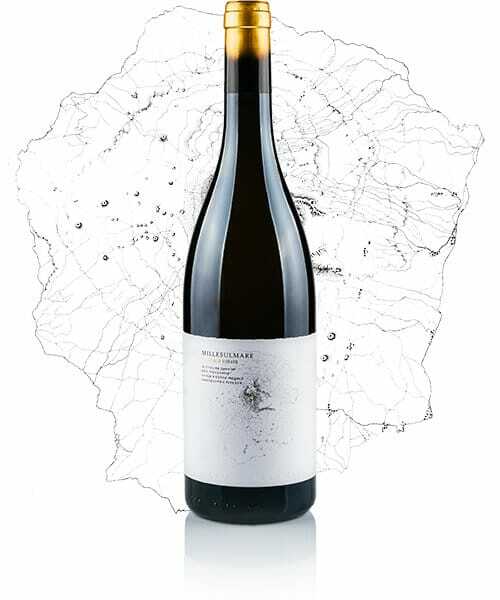 The result of a mass selection that has taken more than fifteen years, Millesulmare is a genuine and volcanic wine, the true symbol of an ancient and mystic terroir, the expression of its wonderful mineral and savoury nuances. A wine with a deeply-rooted identity, produced according to the Etnean winemaking tradition and showing a deep attention to the grapes, whose scents and taste are the symbol of an entire area and leave speechless those who drink it, thanks to the important thermic fluctuations that only heroic vineyards at extreme altitudes can endure. A project which we have been working on since 2004, inspired by our love and our deep desire to preserve and enhance these ancient vine varieties and a territory of such extraordinary beauty. Vine varieties: Grecanico Dorato, many indigenous clones from ancient local vineyards a pie’ franco (ungrafted), grafted on Richter 110 and Paulsen 1103. Almost the 15% of the vineyard was reproduced through propagation by offshoots and therefore it’s a pie’ franco (ungrafted). Area of production: Casa Decima vineyard at Contrada Nave, North-western slope of Mount Etna, almost 1100 meters above sea level. Vineyard characteristics: highly mineral soil, whose lava structure has been formed by centuries of lava flows. Guyot-trained vineyard, with a density of 1,5 x 0,8 meters. A bilateral spurred cordon is used for some lines – through the years we have been monitoring the evolution and the quality of the vines that are grown using this method. The planting process was not invasive at all: inside and all around the vineyard fruit trees, bushes and a large wood area are thriving, all cultivation that deeply adhere to and preserve the traditional local agricultural policy and the Contrada’s micro-ecosystem. Yield: approximately 800 grams of grapes per vine. Climate: typical mountain climate, warm and dry during the long summer days and with temperature close to 0 °C at night. Strong temperature fluctuations during the maturation of the grapes. In winter, the vineyard is covered by a thick layer of snow. The perfect microclimatic conditions and the absence of pollution prevent the onset of diseases and botris cinerea. Grape harvest: the harvest is strictly hand-made, according to the ancient Etnean farming tradition. It takes place during the last week of October or during the first weeks of November and is performed by our local winemakers. They have been living in these areas for generations, perfectly know the characteristics of the vine varieties and are able to careful select the fruits during the harvest. The grapes are put into 18 kg crates and brought to the cellar right after the harvest. Vinification notes: the vinification process is very delicate, in order not to adulterate the true identity of the grapes and of the vintage. This allows the production of a genuine wine, as the Etnean winemaking tradition dictates.The grapes are destemmed and not crushed. After that, they go through a soft pressing process that produces a 60% of first-pressing must. The pressure never goes beyond 0,6 bar. The first-pressing must is transferred into a steel insulated vessel and cold decanted (at 10 °C) for 36 hours, then it’s poured and separated from the lees. Only indigenous yeasts are added. The alcoholic fermentation takes place at a monitored temperature of 18-20°, allowing to preserve its aromatic content. A week later the end of the process, the wine is decanted and separated from the gross lees. After 10 days, the process of bâtonnage is performed once a week. The wine stabilizes at cold temperatures, also from a tartaric point of view. That’s what makes Millesulmare less acidic and softer, preserving the original fragrances of the grapes. After a light clarification and filtering process, Millesulmare is bottled and aged for several months, before it can be tasted by its connoisseurs. traces which lend to this wine a harmonious and persistent finale note. Alcohol content: 12-12,5% depending on the vintage. Food pairing: very elegant when paired with fish dishes, white meat and vegetables. Perfect along with crustacean, shrimp tempura, pasta with sardines and wild fennel, arancini and crispelle with anchovies. Sublime when paired with sushi and sashimi. Great as an ingredient to cook fish dishes. The ideal serving temperature is 7-8 °C. Some sommeliers prefer a higher serving temperatures (approximately 10°C), in order to better appreciate its olfactory complex and it mineral composition. Produced bottles: niche production with very few bottles. Every bottle is accurately numbered. Ageing capability: 8-10 years, depending on the vintage. First harvest: micro-vinifications since 2004 with grapes of the mother plants from the Grecanico Dorato vineyard and, from 2007 onwards, with grapes of our Casa Decima vineyard.